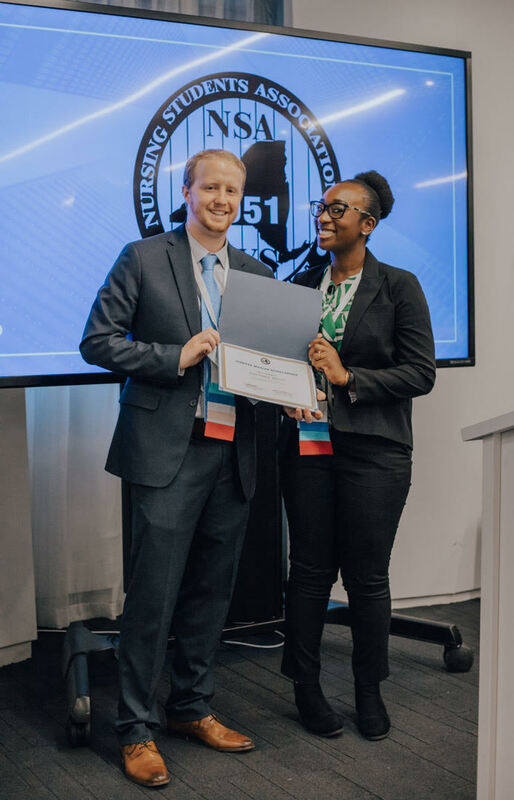 The Nursing Students Association of New Yorker State (NSANYS) wants to feature your accomplishments! Accomplishments may include, but are not limited to: your school's mentoring programs, your local chapter's breakthrough to nursing projects, community health events, fundraisers, your personal nursing research, and awards! Your accomplishments will be featured on NSANYS' website and social media. Click Here To Submit Your Accomplishments! THANKS TO ALL WHO ATTENDED OUR 67th ANNUAL CONVENTION! Special thanks to our keynote speaker, Brian Miller for a magical and inspiring performance. Donate to FNSNA through NSANYS! Please donate today by clicking the link or scanning the QR code! We have joined the challenge to raise funds for nursing student scholarships. Every dollar you contribute is DOUBLED by 3M™ Littmann® Stethoscopes Grant. We want to make sure we can get nursing students through college and into the workforce. Every donation counts and could be doubled! then this is a perfect opportunity to showcase your skills and be published in a pre-professional state association's nursing article! "RESTORING HOPE FOR A BETTER TOMORROW"
​“Early this year, I applied for the NYIT Edward Guiliano Global Fellowship which provides students the opportunity to do a project globally. I applied for the scholarship but unfortunately, I was not one of the recipients. If I was one of the recipients, I planned to use the funds to purchase pre-assembled backpacks and travel back to Haiti to give out the backpacks in my hometown where I grew up to under-served families. Despite the fact that I was not one of the recipients, the thought of many children in this under-served community receiving inadequate education began to weigh heavily on me. So I decided to still move forward with the backpack project and use some of own savings plus $800 that I raised from a crowdfunding site to purchase the school supplies. I realized how fortunate I am; I have been through so many obstacles in life and I was able to use those obstacles as a stepping stone to overcome my situation. I always felt it’s important to give back. When I started my nursing journey at NYIT, I met so many people who have helped me throughout my journey. This is my last year, and I felt like I’m taking everything in, and I’m not giving back. I owed it to myself to do something that will positively impact others. I had my family that reside in Haiti identify local schools that would be appropriate for the mission, and I traveled to Haiti with my daughter for seven weeks. During my seven-week stay, I visited eight schools and three churches. The first day I didn’t expect that many students to show up and I planned to distribute approximately 250 backpacks. To my surprise, so many children came that I ran out of supplies. There were so many kids waiting. They were so grateful and so nice, so humble. They brought me to tears. In all, I distributed 1,500 backpacks.